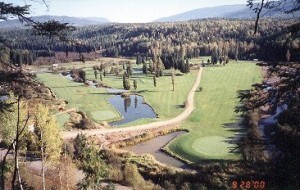 Wells Gray Golf Resort & RV Park located in central British Columbia approximately 50minutes by car from the town of Clearwater. Clearwater is the gateway to the world reknown Wells Gray Provincial Park and while you enjoy the area, Wells Gray Golf Resort & RV Park in Clearwater is the place to be! Regardless of how you camp, this resort has it all, bring a tent, RV, or nothing and there will be a campsite, RV site or cabin just for you! http://www.wellsgraygolfresortandrvpark.com/ at the website you can view a panoramic interactive 360 video. Check it out! Oh, and aside from world class kayaking, hiking, mountain biking, fishing and camping, yes there is Golf! Marigold Resort is located on Loon lake BC near Cache Creek.